Am I missing something or this is a bug? By the way I could not find the change log for the latest version which I am not sure whether it is 4.0.0 as shown in 'About' or 4.0.1 (file version shown as 4.0.1.0). 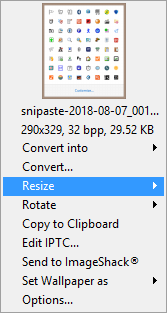 Indeed the file 'XnViewShellExt-Resize.txt' was missing in the previous archive. Program solved, thanks for the quick fix! The extension freeze on PSD file? or during the PSD saving by PS? After watching your video, it seems to me this problem has nothing to do with XnView Shell Extension, maybe it's a SO or Photoshop related issue. Have you tried to check on the Photoshop memory settings? 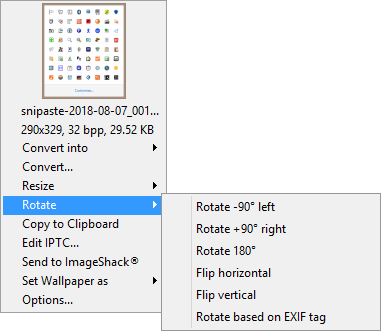 One more question: the menu used to freeze when you opened the context menu within the Photoshop Save as dialog, right? If so, maybe the integration of the extension with the OS shell plus the Photoshop dialog box is the reason for the freezing. But it's just a guess. yes, it is freezing only photoshop, explorer is working fine during this freezing. But i remember what before it was works, it may what my OS has problem, so i am asking to check somebody who have photoshop. I just made a test here, but with Corel Photo-Paint (I don't have Photoshop). I created and saved one simple PSD file. 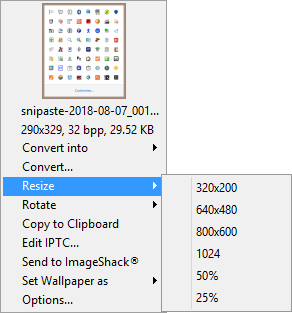 With it still opened in the program, I opened the Save as dialog again, clicked on the very same file I've just saved to launch the context menu and the XnView Shell Extension showed the file's thumbnail — from within the Photo-Paint Save as dialog — without freezing.